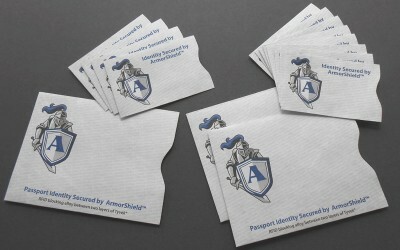 Take advantage of our ArmorShield® RFID Blocking Protector Pack to protect your cards and passport. In this pack you will receive our logoed 2 1/4″ x 3 1/2″ ArmorShield® RFID Blocking Card Sleeves and 3 7/8″ x 5 1/8″ ArmorShield®TX2 RFID Blocking Passport Sleeve. Great gift giving ideas for friends and family members who like to travel or for everyday use.